Launched with the 1990 vintage in 1993, Bin 407 was developed in response to the increasing availability of high quality cabernet sauvignon fruit. Inspired by Bin 707, Bin 407 offers varietal definition and approachability, yet still with structure and depth of flavour. 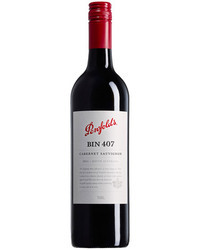 Textbook cabernet sauvignon, the varietally expressive Bin 407 highlights the rewards of Penfolds multi-region, multi-vineyard blending, with a core of ripe fruit supported by sensitive use of French and American oak.